Catchers … what a dumpster fire for a fantasy position. I can’t remember it being worse. It probably was at some point but with the increased knowledge of pitch framing, more horrible hitting catchers are accumulating plate appearances. Today, I’m going to go through the natural catcher tiers for various league types and show where owners need to buy for the best values. Before I go any further, I need to explain a few concepts. I’m going to be using Standing Gain Points (SGP) to differentiate the various players. The main reason I like to use SGP is it takes all of player’s Roto stats and combine them into a single value. This important with differentiating the value of a speedster leading off or a middle of the lineup slugger. Additionally, I’m using The Process’s 15-team, two-catcher formula for all the following comparisons. It may not be the perfect formula when comparing different league types but it will provide a nice baseline. To put into perspective how bad catchers are, I’ll start with my recent non-adjusted hitter rankings. The first catcher, Gary Sanchez, was valued as the 88th hitter. The next two were J.T. Realmuto at 169th and Buster Posey at 170th. Overall, the position is a mess but I need to start the analysis by finding the talent range within the position before bringing in other hitters. There is no better way to start the catcher discussion than the following graph of the top-40 ranked catchers. Before I go on, here the top-31 with the SGP for various leagues sizes. The drop from the first tier to the second and second to the third is about 2 SGP which equates to about $4 in auction value (more on this in a future article) using a 67/33 split. These are significant breaks. While I personally may be out of the top two who both have an NFBC (15-team, 2 catcher league) ADP (average draft position) of 59. The next five have ADPs of 105, 141, 144, 148, 156. I would like to emulate my closers strategy, I want to own one from this tier but hopefully, pay for just the last one. The participants in the NFBC have also noticed this gap with the next catcher going at pick 243 and eight more going before pick 276. The similarity in pick and these values are almost eerie. The talent really begins to thin out with catchers 14 to 23 separated by just 0.7 SGP. From there on, the talent pool just drops as playing time becomes harder to come by. Using the above table, the replacement level talent in the tiers can be seen. “Talented” catchers with “decent” better replacements can normally be found in both one -catcher leagues. In two-catcher, 12-team leagues, the talent starts dropping off right at the last pick so the key here is to not be the last person taking a catcher. Finally, in two-catcher, 15-team leagues, there are the same top-23 guys and then raw sewage. My goal is to stay out of the sewage and get two of the top-23. For a comparison of the various replacement levels, here are the stats for the three catchers at and around the last catcher picked for each league type. The one advantage of getting one of the top-12 is a higher batting average and more counting stats. The final step is to determine how much of a replacement adjustment should be included in for catchers. The key is to stay away from having to roster sewage, especially in both of the two-catcher formats. Here are the replacement level values for catchers and the rest of the hitter pool assuming 14 hitters with an extra Utility spot in the one-catcher leagues. IMPORTANT NOTE. In the two-catcher formats, the replacement level for the catcher drops but also, the non-catcher adjustment increases. This increases because fewer non-catchers need to be rostered. The biggest replacement-level adjustments exist in two-catcher, 12-team leagues. Going back to Sanchez, he is ranked as the 88th overall hitter but is going off the board as the 38th hitter in NFBC because of this adjustment. His value was at 19.1 SGP and adding in a 6.2 adjustment places his value at 25.3 SGP or the 16th most valuable hitter between Nelson Cruz and Bryce Harper. Catchers carry with them some extra perceived injury risk, so owners are going to let them fall some, but not too far. 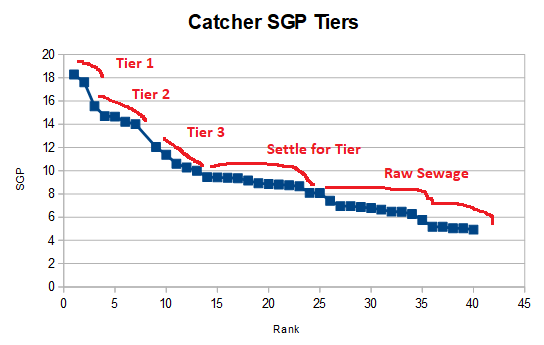 Hopefully, everyone has a better understanding of the catcher landscape and when I post some overall rankings in a few days, I’ll have this article to reference why catchers are so high. It’s a win-win for everyone. We hoped you liked reading Catchers … What a Dumpster Fire by Jeff Zimmerman! It’s a facade, the way fantasy values catchers needs to change. Defensive catching is actually the best its ever been in MLB history. The issue is traditionally catchers were valued by MLB teams and ranked from best to worst strictly off of bat Avg. Now MLB teams could care less if they can hit or not, as you have some of these catchers putting up 4-5 true war in a season hitting .220. True War meaning not here at fan graphs as they don’t calculate war correctly for C as MLB and BP does. All because of the framing and blocking and throwing defensive metrics. Times have changed. Long gone are the days were you have catchers in a game who cant catch but can hit…exception being someone like gary sanchez. Even if that’s all true, (standard) fantasy baseball isn’t real baseball. Defense only counts to the extent that it may get a poor hitter more playing time, or a good hitter less. I’m just stating the obvious but there are countless things that are valuable in real baseball that aren’t (directly) valuable in fantasy. If you want to play in a niche league that counts defense, FIP, WAR, wRC+ or anything like that, feel free. But for the vast majority of us, we use our knowledge of these things to (hopefully) predict how they impact the traditional stats that are directly scored. 100% agree with you. his whole write up is saying how catchers are a dumpster fire and i was just saying why. Because MLB teams are playing catchers because of defensive metrics not how good they can hit like they traditionally did. MLB teams have changed. Really catchers are the best defensively as they have ever been. You just don’t gete points for that. Agreed. But your first sentence was “the way fantasy values catchers needs to change” – I’m just saying that’s not necessarily the case. I could just as easily say “fantasy should stop giving credit for wins” but standard leagues still award 10% of their points for pitcher wins. I agree it would be cool in a way if fantasy leagues valued players accurately, but I also think it’s, I don’t know, some combination of charming/nostalgic/challenging to use the old categories and see who’s the best at using newer stats to predict them. You might like playing in a Diamond Mind league, as defense matters (though it can’t really emulate framing correctly).